The White Tuna / Albacore is caught in summer in the Bay of Biscay by selective, ecological and traditional fishing (pole and line). Read more about albacore fishing. Arroyabe is certified in the MSC chain of custody standard. The MSC Standards define the requirements for fisheries to be certified as sustainable and for business to trade in certified seafood. Learn more about MSC certified seafood preserves. Our products are in compliance with Friend of the Sea Criteria for Sustainable Fisheries. Friend of the Sea is a non-profit, non-governmental organisation, whose mission is the conservation of the marine habitat. Products and their origins are audited onsite by independent international certification bodies, against strict Friend of the Sea sustainability criteria. 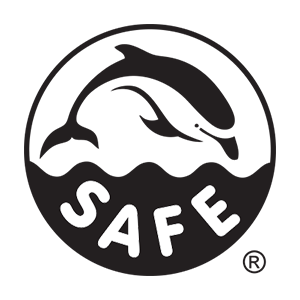 All our products are Dolphin Safe certified, which assures that the tuna does not come from vessels that chase and encircle herds of dolphins. In 2014 we were awarded with the Eroski Award for sustainability by Eroski, the largest supermarket chain in the Basque Country. The award recognizes our work to minimize the environmental impact and our commitment with sustainable fishing.